The Vitincom range of information and poster display cases are produced for indoor and outdoor use. Manufactured in France, Vitincom products have become extremely popular in the UK. All units are extremely functional and durable, the quality is unquestionable and the pricing competitive. All the poster display cases and light boxes on this page can be front illuminated with a Vitincom lighting kit. The kit is complete with a high intensity fluorescent tube strip light and 80mm reflective adhesive film laid externally on top of the glazing as a reflector to illuminate posters, menus and information printed on substrates like heavy weight paper or card that cannot be back lit. Single sided poster display case for wall or post mounting. 75mm deep aluminium frame. Integrated hinge door or raising door using gas struts, replaceable and reversible without tools and without having to remove the poster display. 4mm Plexichoc or Security glass. "Safety" lock with 2 keys (2 locks at a height of 1350mm). on the door section. Elastomer seal and anti-condensation vents. Zinc electroplated steel backboard with a white lacquer finish. Finish: Silver anodised or painted in Bordeaux 3004, Green 6005, Blue 5010 or Brown 8017 RAL colours. Quatro posts are available in silver anodised or one of our RAL colours. Illumination for Vitincom poster display cases and light boxes comes as an easy to install LED kit. Poster display cases Classic, Classic sliding-door & dual-door ''1000'', ''2000'' single & double-sided ''3000'' single & double-sided can be fitted with an ''LED lighting kit'' of the appropriate size, to be fitted by your installer. You can add a second kit in the lower part of the poster display case for added impact. The electrical wiring must be installed by a qualified person to comply with applicable safety regulations. The cable exit is not predefined in order that the installer can choose the most suitable position.  Wear resistant and warp proof integrated hinges.  "Safety" locks manufactured exclusively for Vitincom® with the latch unseen from the outside.  100% of the display surface protected by fixing the lock on the aluminium frame and not the glass.  Easy to use, press hinge doors to easily open them outwards.  Door replaceable with the same model in case of damage or vandalism, without tools or removing case.  Reversible door can be changed to left/right opening without tools or removing the case. Two oblong and dovetailed aluminium posts 80 x 125 with black lacquered aluminium top caps. Each post supplied with 2 dovetailed cast aluminium clamps. Poster display case fitted easily without drilling. Poster display case height adjustable. 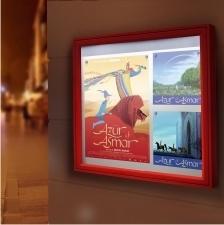 Quatro Plus are available to align several poster display cases or place them at 90 degrees. Available in silver anodised or painted one of our RAL colours. Single sided poster display case for wall or post mounting. Aluminium frame 58mm in thickness. Integrated hinge door, replaceable and reversible without tools and without having to remove the poster display. 4mm Plexichoc or Security glass. "Safety" lock with 2 keys on the door section ( 2 locks at a height of 1350mm). Elastomer seal and anti condensation vents. Zinc electroplated steel backboard with a white lacquer finish. Finish: Silver anodised or painted in RAL colours Bordeaux 3004, Green 6005, Blue 5010 or Brown 8017. Consisting of two aluminium posts with Black top caps. Universal fixing system on the back of the poster display case using brushed stainless steel brackets. Root fixing or base plate post options available. Single sided poster display case. 75mm deep aluminium frame. 2 doors using integrated hinges, replaceable without tools and without having to remove the poster display. 4mm Plexichoc or Security glass. "Safety" lock with 2 keys. Elastomer seal and anti-condensation vents. Zinc electroplated steel backboard with a white lacquer finish. Finish: Silver anodised or painted in RAL colours Bordeaux 3004, Green 6005, Blue 5010 or Brown 8017. Single or Double sided poster display case. 75mm thick aluminium frame. Radius corners in cast aluminium. Integrated hinge door or raising door using gas struts, replaceable and reversible without tools and without having to remove the poster display. 4mm plexichoc or security glass. 2 ''safety'' locks with 2 keys each (1 lock only on 1000mm model). Elastomer seal and anti-condensation vents. Zinc electroplated steel backboard with a white lacquer finish. Finish: silver anodised or painted in our RAL colours Bordeaux 3004, Green 6005, Blue 5010, Brown 8017. For wall or post mounting with or without illumination. Specification as "2000" above, but is 150mm deep. And is available in the following sizes, with or without illumination. Different from all the above poster cases, this light box has back lighting and internal partitions to which the posters are attached, 20mm behind the glazing and is available single or double sided. 4mm tempered shatterproof glass, partitions are in 3mm white light diffusing polycarbonate. EC approved lighting by 58 W fluorescent tubes with ballast. Poster attachment: by self-locking friction clips. Single sided box. 150mm thick aluminium frame. Radius corners in cast aluminium. Raising door using gas struts, replaceable without tools and without having to remove the poster display. 4mm security glass. 2 ''safety'' locks with 2 keys each. Elastomer seal and anti-condensation vents. Zinc electroplated steel backboard with a white lacquer finish. Finish: silver anodised or painted in our RAL colours (Bordeaux 3004, green 6005, blue 5010, brown 8017). Two aluminium posts 60 x 40 with black top caps. Universal fixing system on the poster display case, using brushed stainless steel brackets. Finish to match the colour of the poster case. Height 2600mm to be embedded into a concrete base or height 2200mm mounted onto base plates (ground hoop bolts supplied).